Let’s be honest, New York City is nowhere near the most bicycle friendly city in the US, let alone compared to some cycling meccas in Europe. Yet it’s rapidly making improvements, and once bikesharing comes to the city, things will radically change. Unfortunately, facilities for cyclists are very unevenly distributed, with much of Lower Manhattan, Downtown Brooklyn, and Williamsburg well covered in terms of bike lanes, while Midtown and the Upper East and West Sides have sporadic lane milage. Considering how important these areas are economically, culturally, as well as being transport interchanges, it is vital that cycling be an viable transportation choice. This post will focus mainly on Midtown and the lower portions of the Upper East and West Sides. 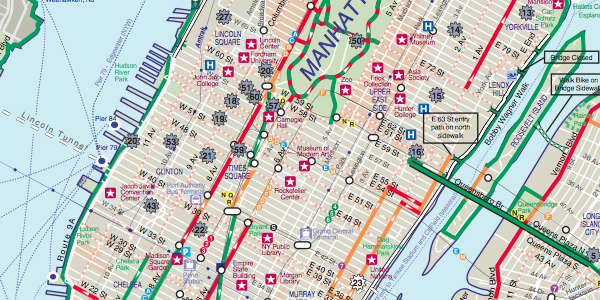 The following map comes from the official New York City bike map and provides a good overview of the area in question. What’s first prominent when looking at a cycling map of the area is that above 34th Street, only two avenues (6th and 8th) and Broadway have substantial facilities. Because transportation in Manhattan is mainly on a north-south axis, the first priority is that each avenue, at least the central ones, should be provided with a protected lane such as that on 8th. Apart from major crosstown arteries such as 34th, 42nd, and 59th Streets, the number of smaller east-west streets allows for better distribution of cycle traffic, reducing the need for dedicated facilities on these roads. The street pairs of 33rd/34th and 50th/51st are good candidates for unprotected lanes as they are cross streets for all subway trunk lines in Manhattan. For the streets above 59th, it is important to consider connections to the Central Park transverses; for example, there would be unprotected lanes on W65th/66th, W71st/72nd, W96th/97th, and 110th (Central Park North) in addition to those that already exist. The importance of adding lanes such as these cannot be underestimated. As the city continues to grow, our current transportation modes are already strained. Most subway lines are at capacity and road traffic during peak hours is out of control. Cycling is a useful midway point between rapid transport for long distances and walking for trips of a few blocks. It can reduce the need for subway trips of only a few stops and is more flexible than fixed-route transit. Upgrading bike infrastructure now will make not only cycling more attractive but is also necessary to handle the impending demand that bikeshare will bring when it arrives in New York City in the next few years.